The rounded shape of our circular fire pits encourages pulling seats up in a circle around the dancing flames. 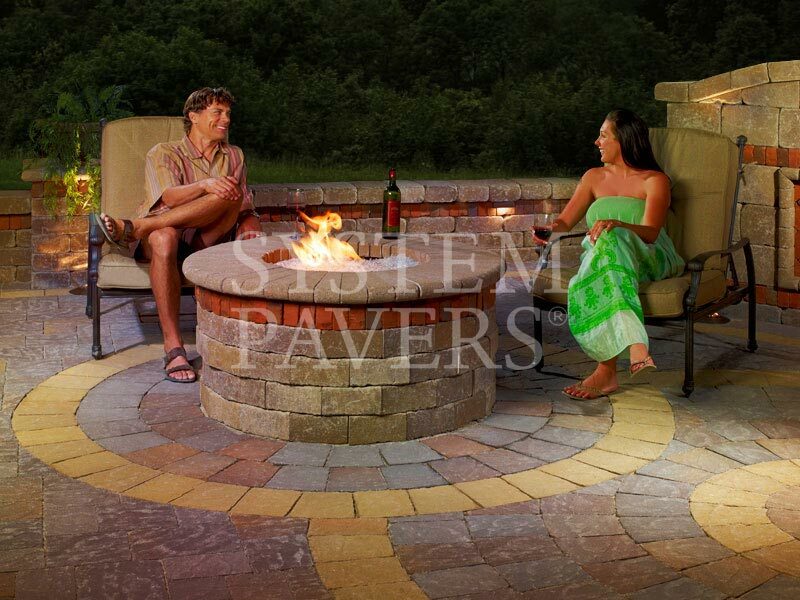 This allows for easy conversation between a group and gives everyone equal access to the fire’s heat. 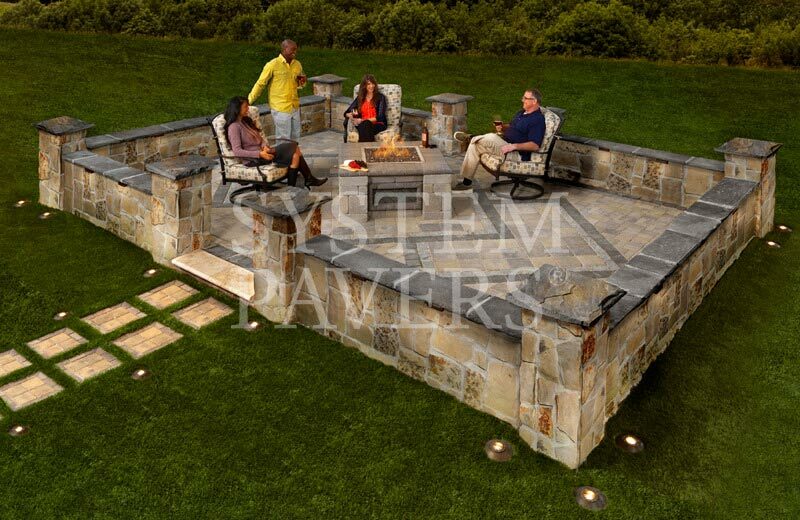 The length of our rectangular outdoor fire pits creates a unique visual element within an outdoor space. 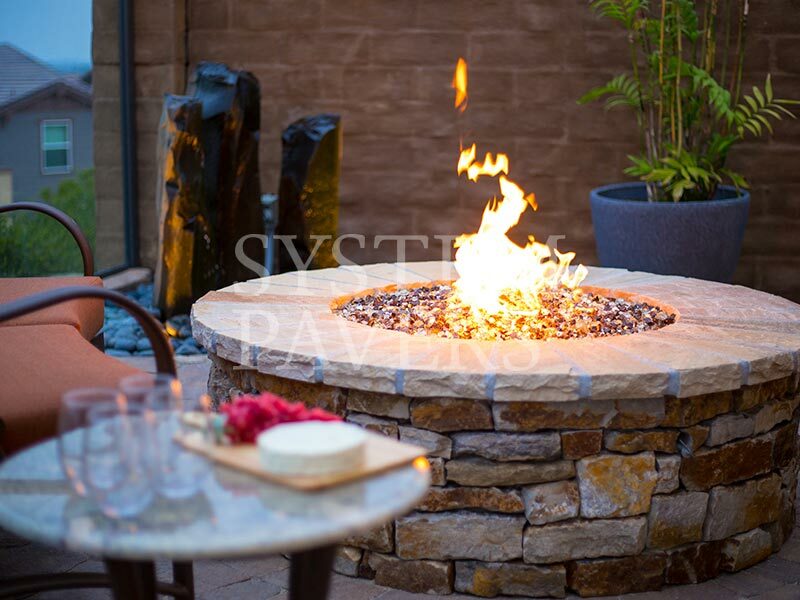 Plus, the heat from the fire will provide warmth on chilly evenings and make your outdoor space more comfortable during the colder months. 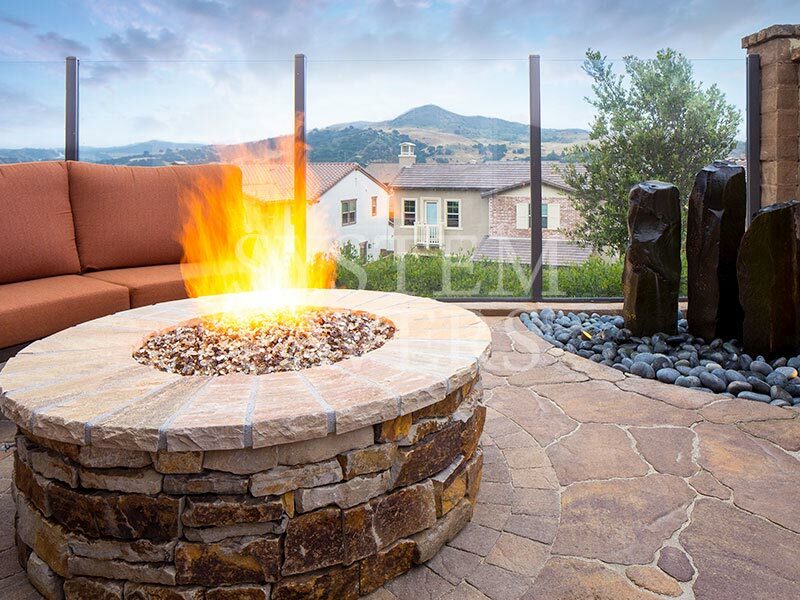 Perfect for big families and larger gatherings, our L-shaped fire pits allow flames to spread out in two separate directions. 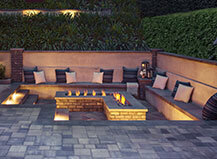 This creates added space for seating and allows more people to gather around the fire’s warm glow. 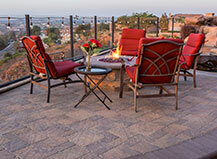 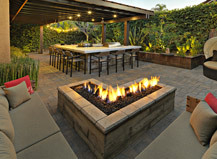 The beauty and warmth outdoor fire pits provide can be compromised if proper care isn’t taken to prevent fire hazards. We make safety a priority and will ensure everything from your fire pit’s operating mechanisms to the walkway surrounding it is designed to keep the fire contained. 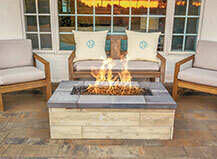 There’s nothing quite like watching a fire’s mesmerizing flames while relaxing in a cozy seat nearby. 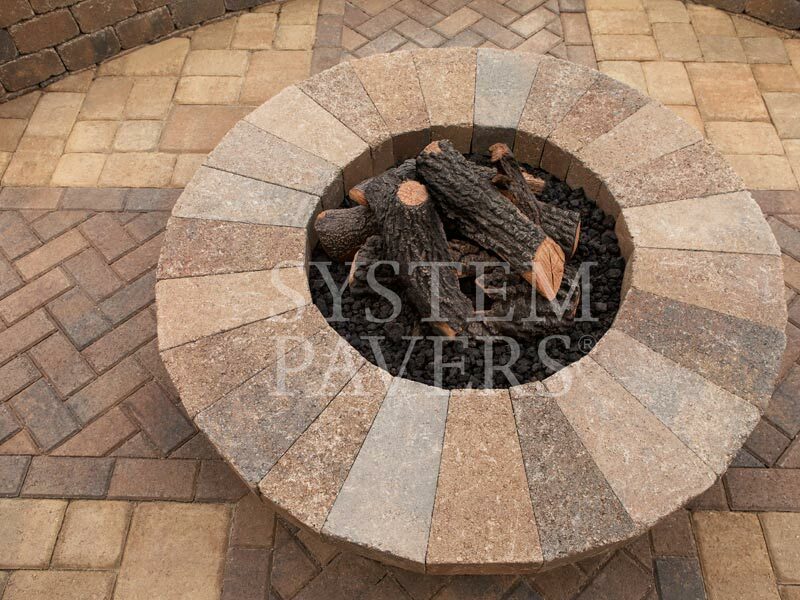 Whether you plan to toast marshmallows with your kids over the open flames, impress party guests with a dazzling display, or enjoy quiet conversation with loved ones while the fire crackles, we’ll design an outdoor fire pit that meets your idea of comfort. In addition to your lifestyle, we’ll consider your home’s architectural elements while designing your outdoor fire pit. 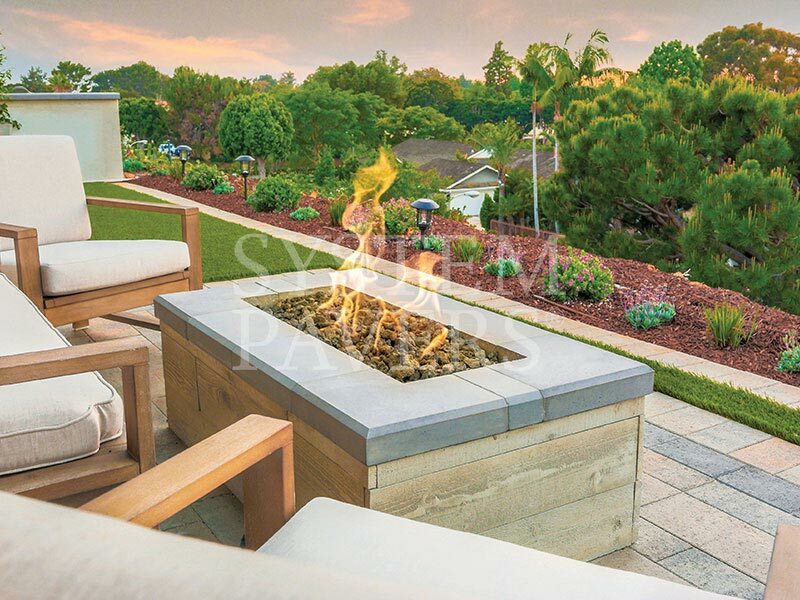 Our natural stone and Capri fire pits offer endless possibilities for customization so that your new fire pit will complement your home and personal style beautifully. 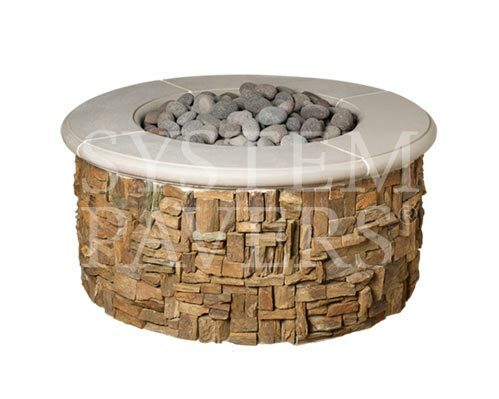 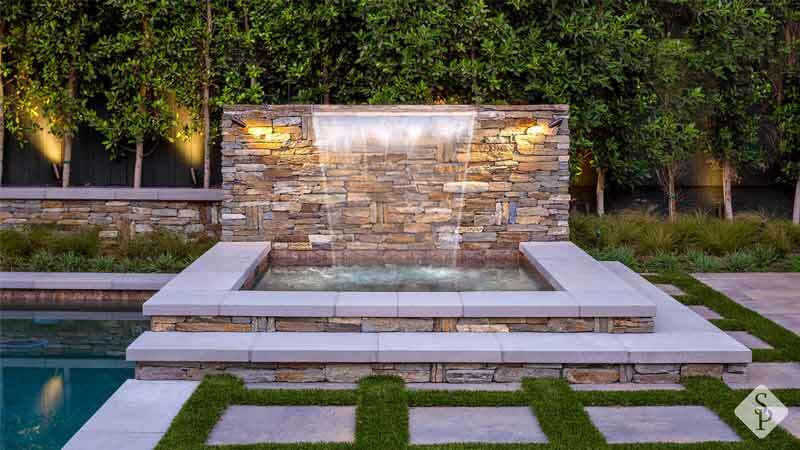 Imagine the peaceful glow and warm ambiance that will be cast over your outdoor space while your fire pit is lit. 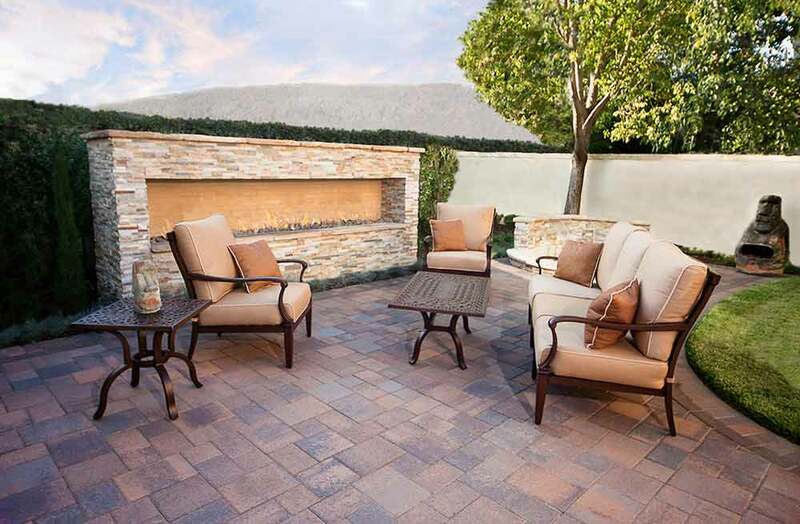 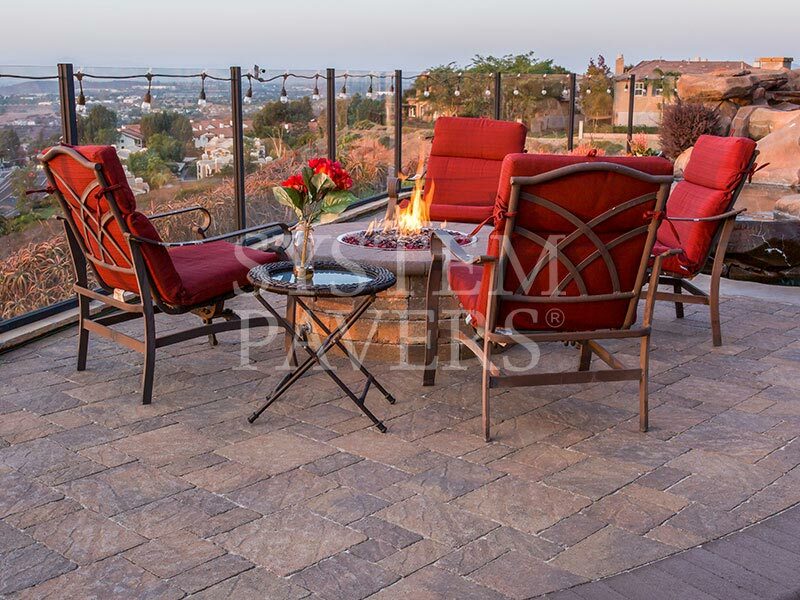 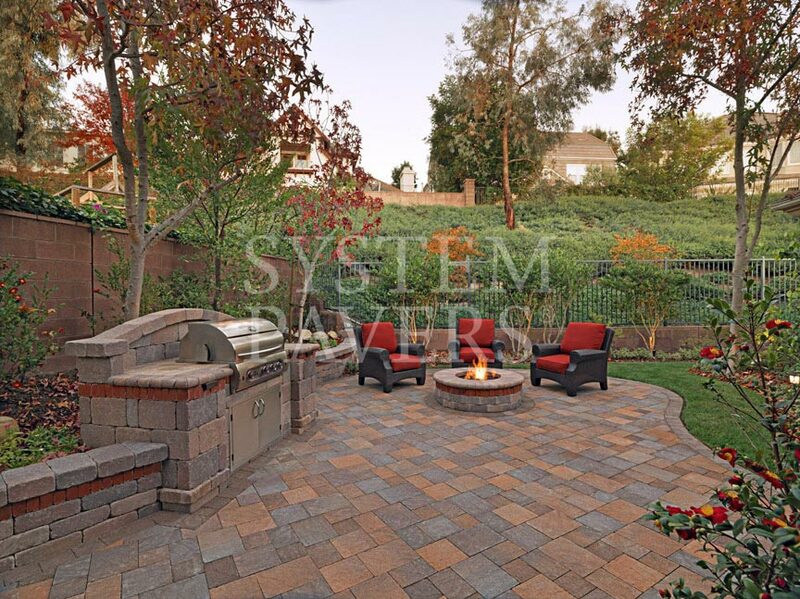 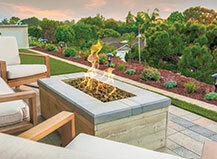 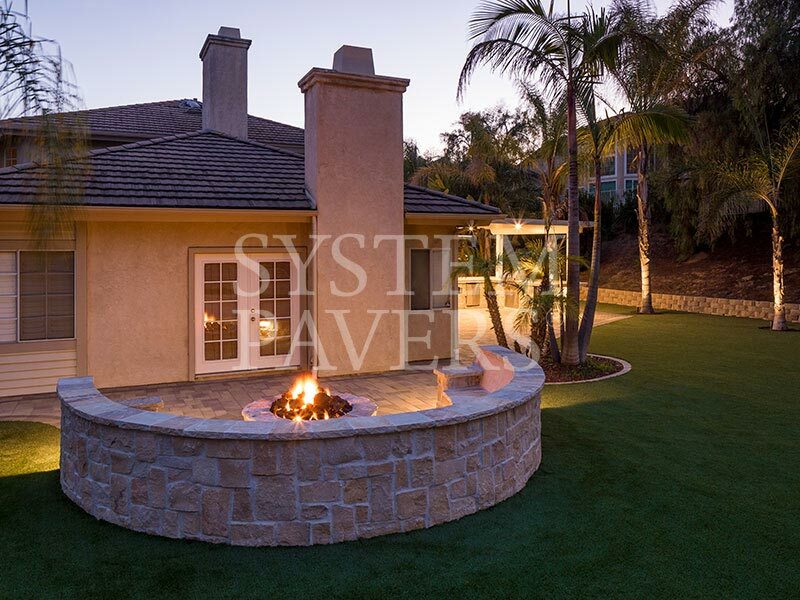 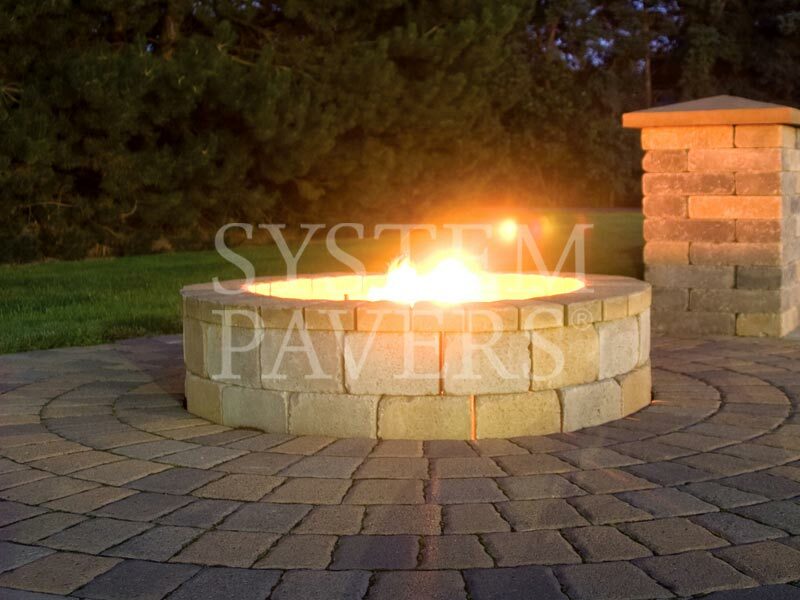 System Pavers’ custom-designed outdoor fire pits allow you to select your ideals for comfort and style so that you can enjoy your outdoor space in a way that feels like you. Off-the-shelf fire elements simply can’t match the customization options available with our outdoor fire pits. Our circular fire pits are a classic style, perfect for gathering around to toast marshmallows with the kids. See some of our finished designs. 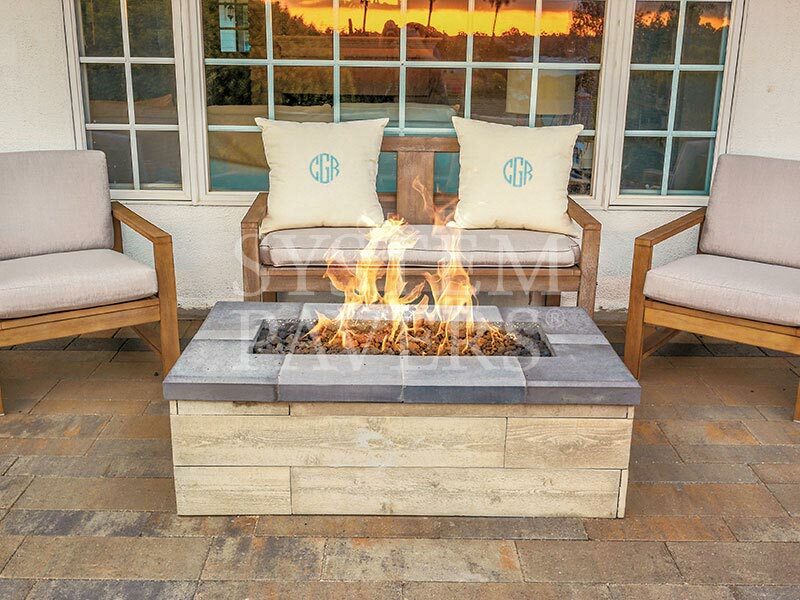 Our L-shaped fire pits add elegance and interest to outdoor living spaces. 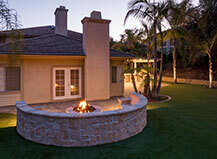 Check out our completed projects. 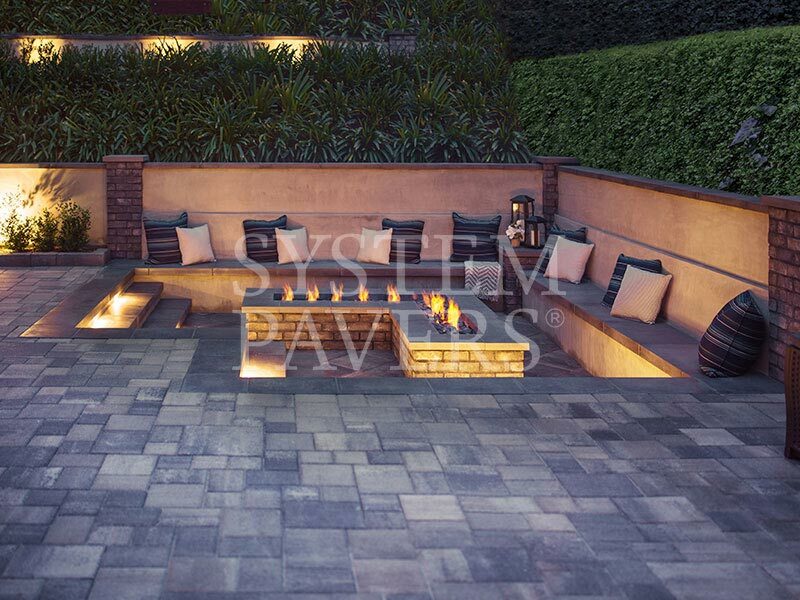 Available in both natural stone and Capri, our square and rectangular fire pits are ideal for modern designs. 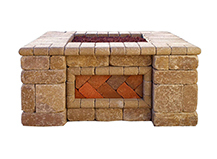 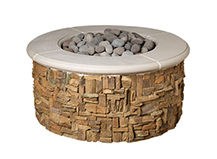 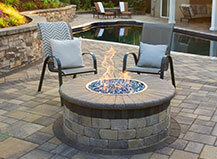 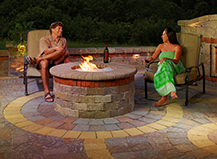 What kinds of surfaces can you install a fire pit on? 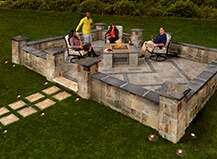 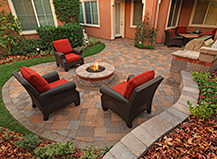 Fire pits can be installed over surfaces including stone pavers and turf, but should never be installed over grass. 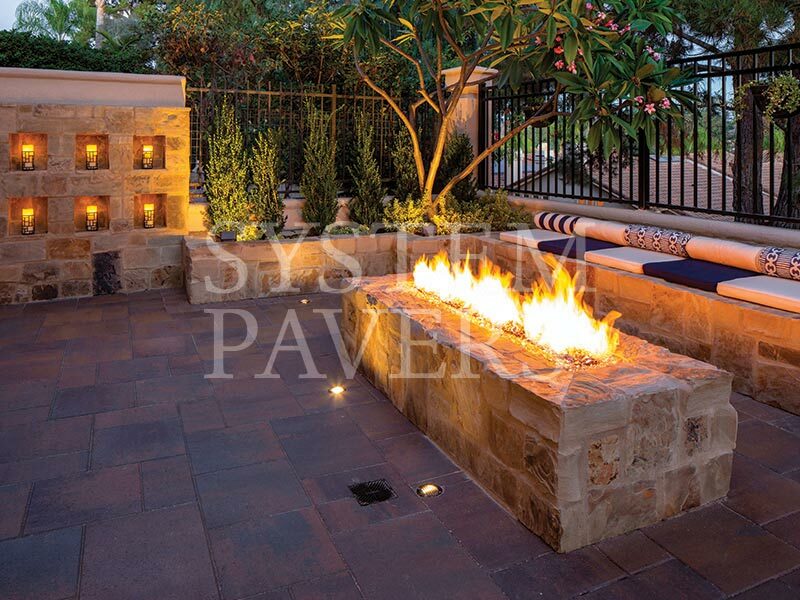 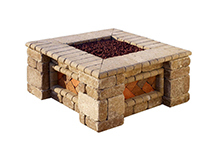 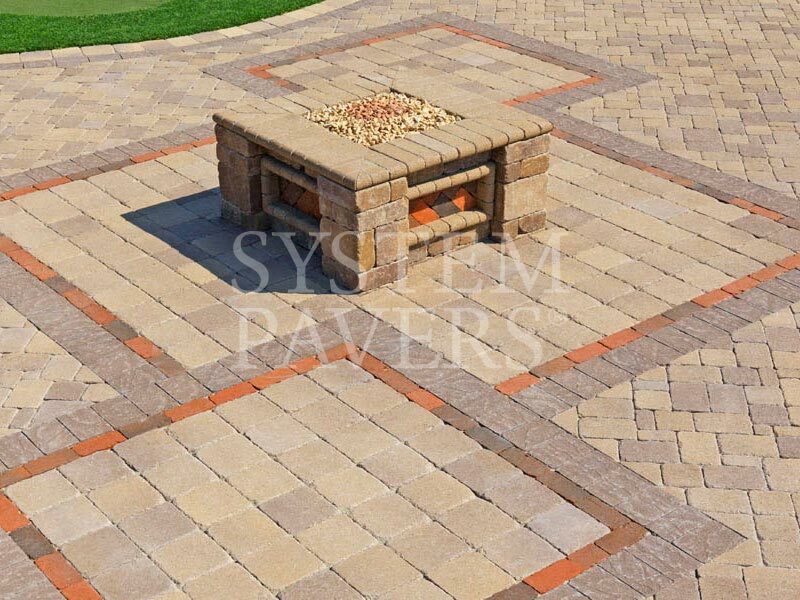 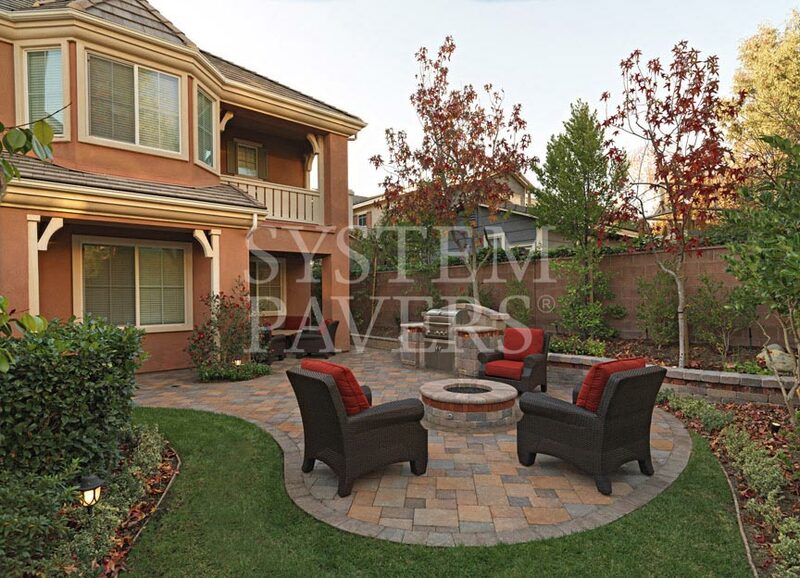 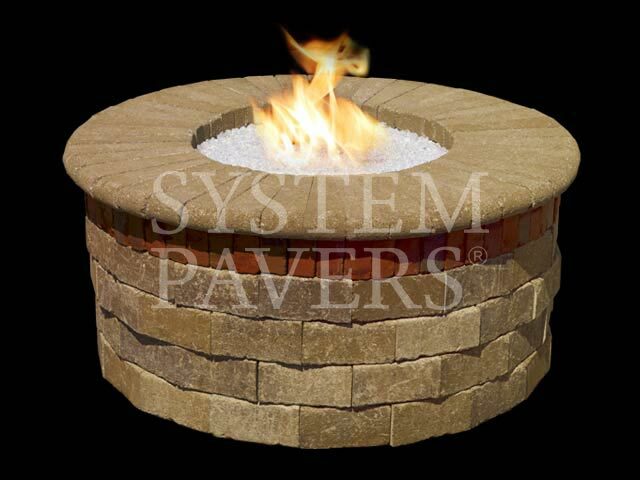 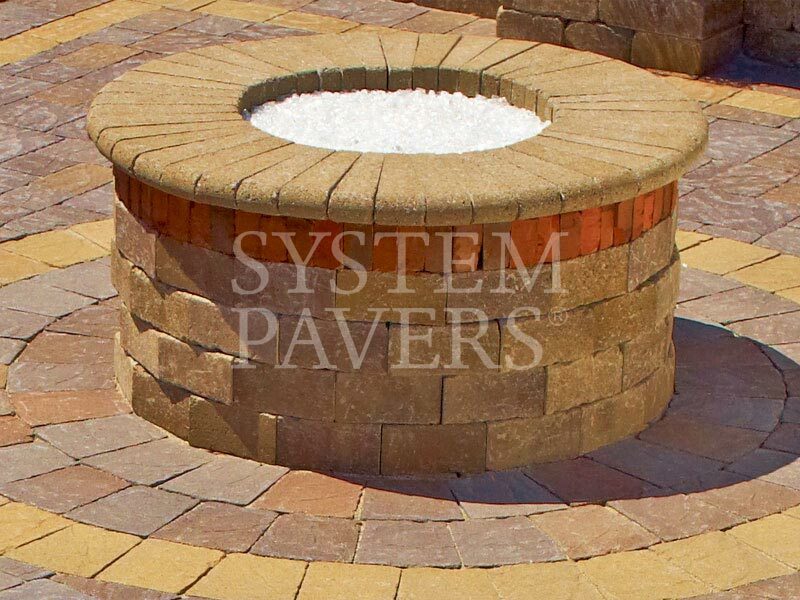 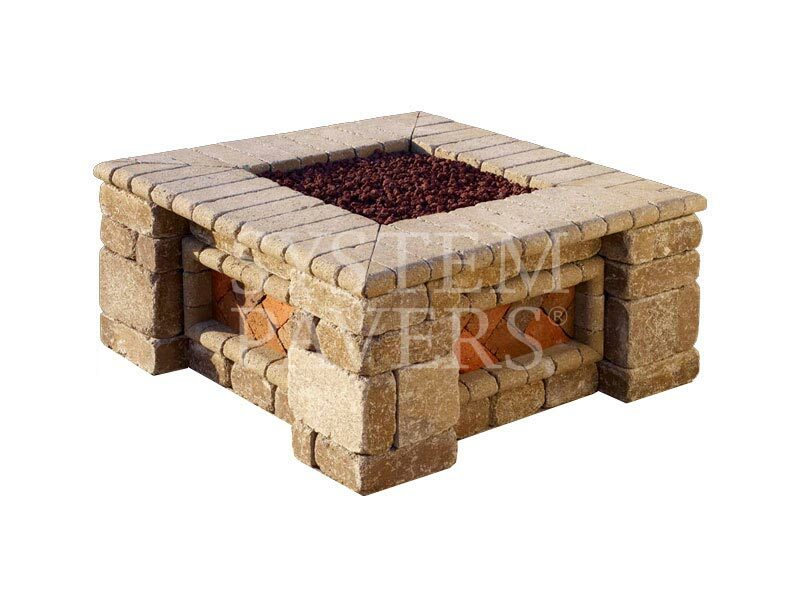 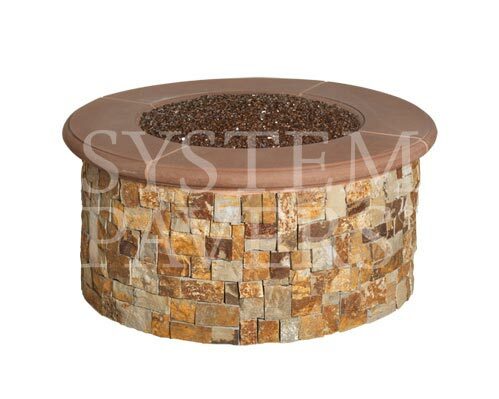 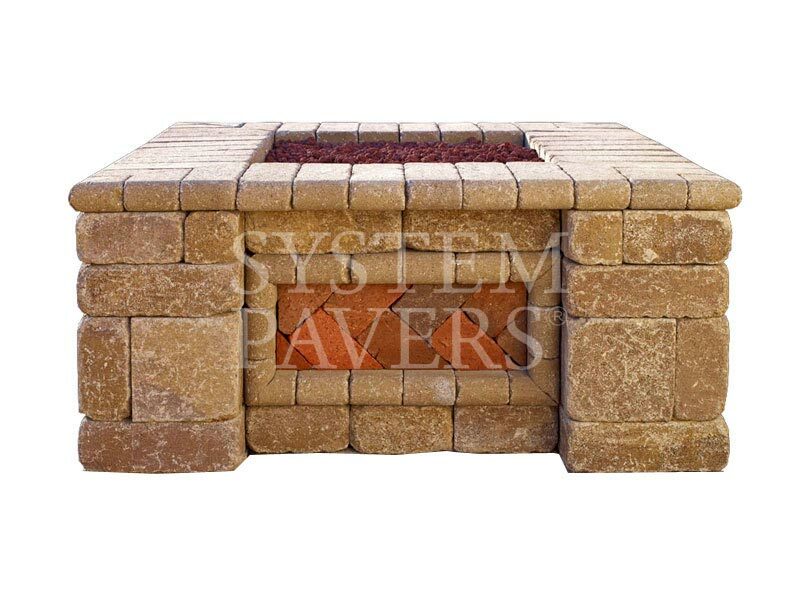 Are System Pavers fire pits freestanding or built in? 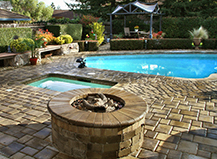 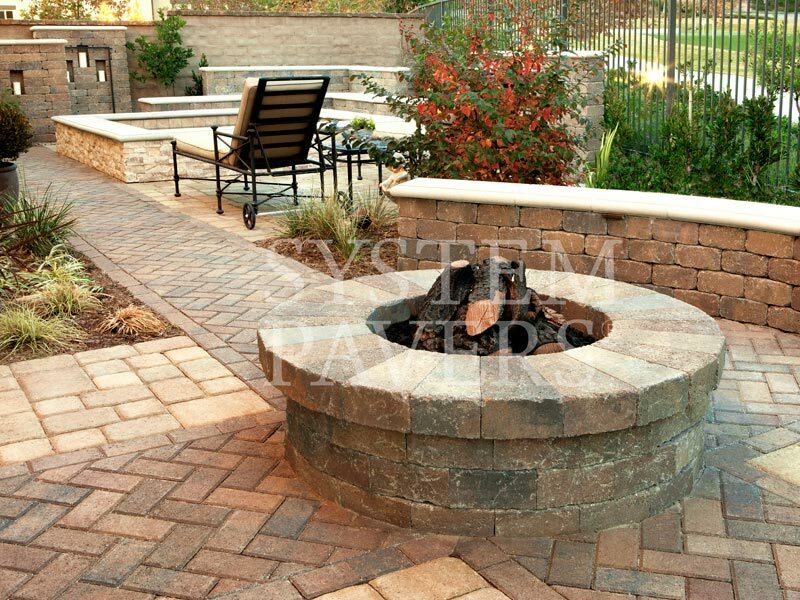 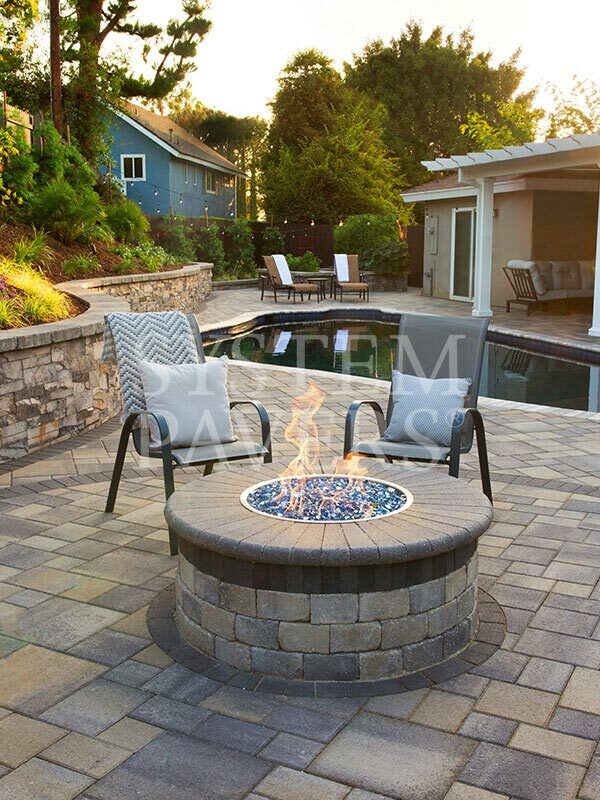 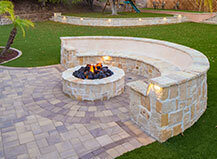 Each custom fire pit is built directly into the hardscape design with appropriate gas lines. 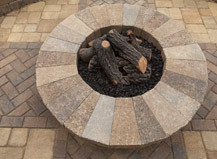 How far away does a fire pit need to be from a house? 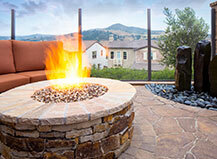 Fire elements should be a safe distance from your home or another outdoor structure. 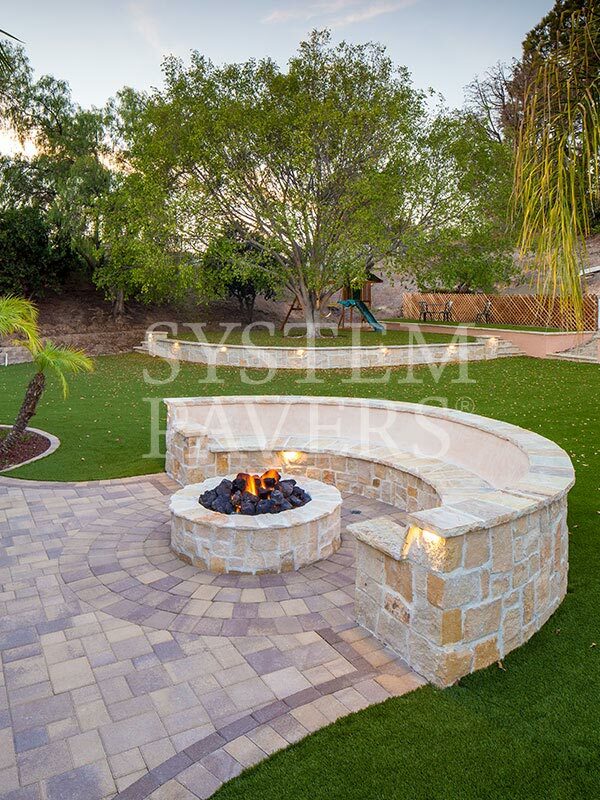 Our expert designers always take these factors into consideration. 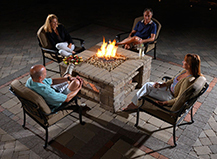 Outdoor Fire Features: Family, Friends and Fun! 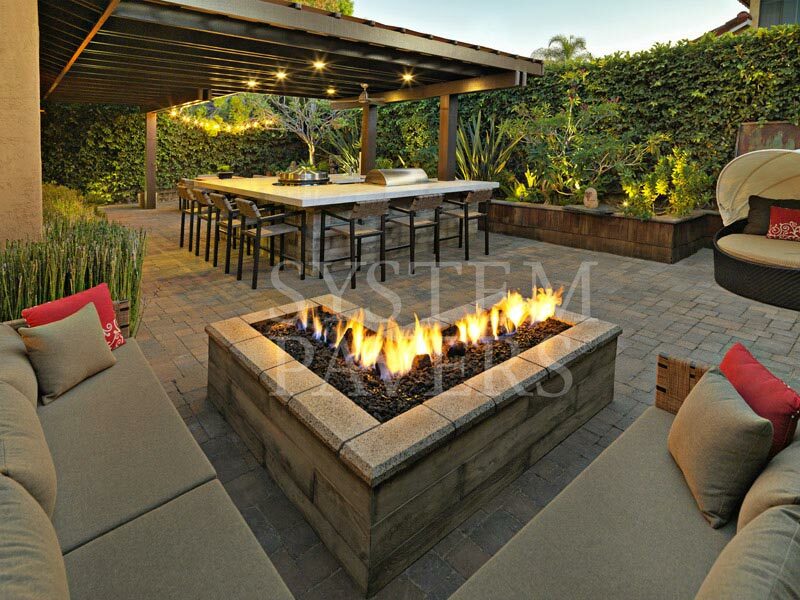 Cozy up in front of an outdoor fireplace, gather around a fire pit or unwind by a contemporary fire bowl and enjoy some quality time together outdoors. 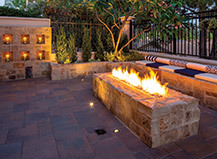 Here are three fire elements that will complete your outdoor living transformation this winter. 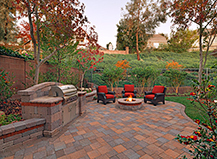 People say the kitchen is the heart of the home. 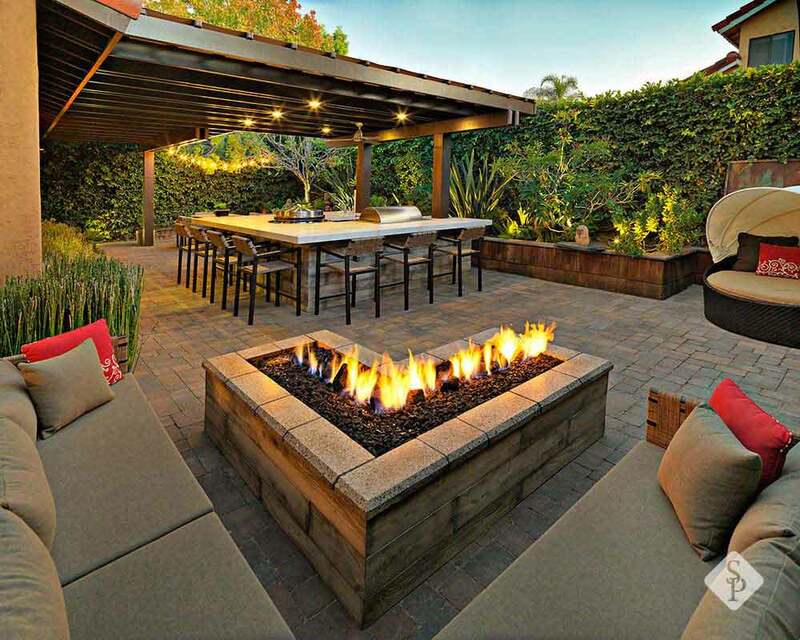 But what if you spend all your time outdoors? 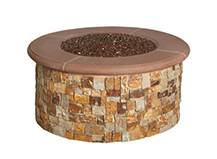 Well then you will love having a fire pit as the focal point in your outdoor living space.